Do you limit yourself out of fear that others will cut you down, criticize you, or be jealous of your success? Do you worry that your friends and family won’t support you if you follow your heart and reach for the stars? Does fear of what-could-happen hinder your growth and expansion? It’s cozy and comfortable to remain cocooned in the familiar. However, sometimes in order to grow it’s necessary to step beyond the confines of your surroundings and break through self-imposed barriers. This can be scary as hell. Like a baby bird flying free for the first time, once you leave the comfort of the nest, the world is filled with obstacles and potential hazards, but also there’s the opportunity to spread your wings and soar. Although criticism can feel earth-shattering, it isn’t always a bad thing. Although I know this to be true, my heart and my head are sometimes at odds about this. I’ve been known to crumple into a wet mess of tears upon the slightest hint of denigration. However, I also know that not everyone will agree with me or like what I have to say. If they did, I would be playing it too safe. Criticism can actually be a sign that you’re on the right track. It means you’re casting your net wide and expanding your horizons. 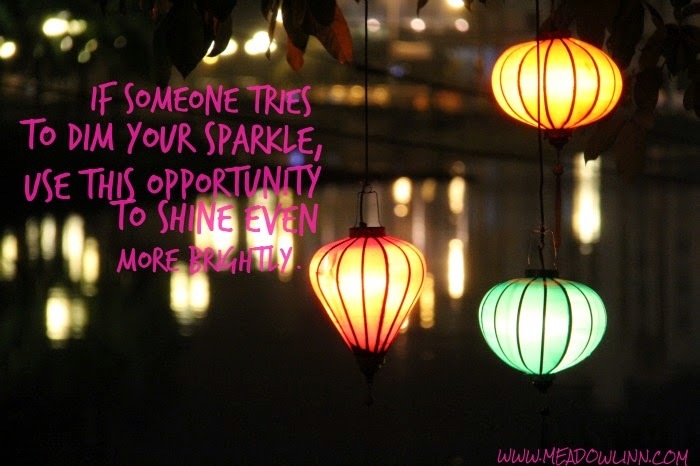 Has anyone ever tried to dim your sparkle? It can be easy to take it personally, and it can even make you want to take cover under a rock and stay there…forever. It hurts to be judged harshly or unfairly. Fear of censure, critique, or reproach can hinder our growth, and it can also keep us from being our authentic selves. Do you keep your beliefs, thoughts, or ideas to yourself rather than share them out of fear that others won’t agree? The truth is…the more you share, the more you grow, and the more successful you will be. Even the most inspiring, wise, and amazing teachers, leaders, and visionaries are not without their detractors. However, it can take tough skin to get to the point where it rolls off you. But, if you can use the criticism as fuel to continue forward with even more determination, there’s no limit to what you can achieve. I’m extremely sensitive, and I can’t guarantee that the next time I’m criticized, it won’t sting with the ferocity of a hornet’s bite. But, I also know that if this didn’t happen from time to time, I’d be playing it too safe. When we try to please everyone, in the end we please no one, and especially not ourselves. 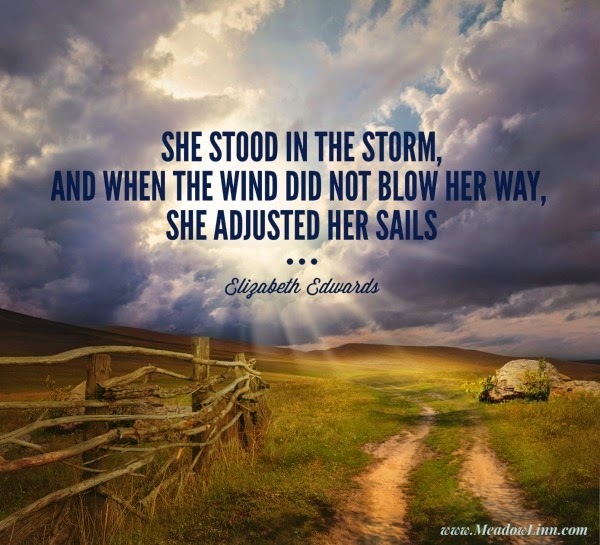 I love this quote from Elizabeth Edwards: “She stood in the storm, and when the wind did not blow her way, she adjusted her sails.” Rather than feeling frustrated that the wind is not going your direction, use the wind to your benefit. 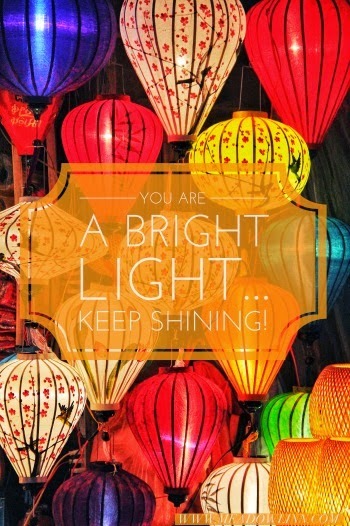 Here’s to shining so bright that criticism of any sort bounces off you like rubber. I believe in you! I spent two weeks traveling in Vietnam with my family for the holidays. The radiance of the people we encountered in markets, the smiling faces on street corners, and the waving children in riverboats belied the atrocities of just forty years ago. Despite having lost pretty much everything, the people we saw seemed to have not just survived but thrived. It seemed that they have found a way to adjust their sails so the wind could blow them into a bright and joyous future. From what we could see, the past has not dimmed the sparkle of the present; it has only made it more vibrant. 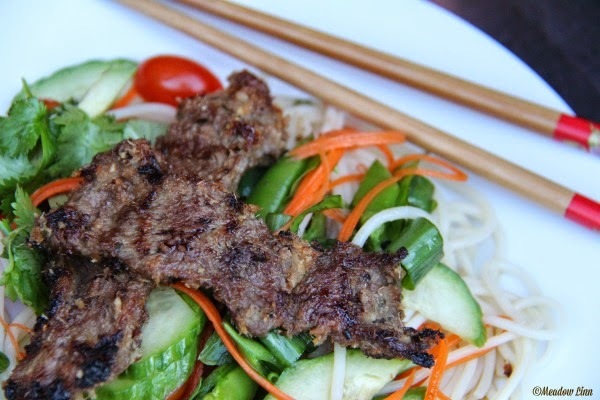 This mouthwatering recipe was inspired by the flavors of Vietnam. It reminds me of the joy, radiance, and resilience that is possible when I let go of fear and embrace the future with wide-open arms. Firm tofu can be used in place of the beef for a delicious vegetarian alternative. Use only the bottom 3-4 inches of each lemongrass stalk, which is the most tender. Trim the end as you would a carrot and pull off and discard any outer layers that are too fibrous (You’ll know because they’ll be hard to cut through). Rough chop the lemongrass and put it in the bowl of a food processor fitted with the chopping blade (Or, you can use a large mortar and pestle). Add the kaffir lime leaves, shallots, and garlic. Sprinkle the coconut sugar, pepper, and salt into the food processor. Process until smooth-ish (You want it to still have a tiny bit of texture.) Add the lime juice, fish sauce, and vegetable oil. Process until fully combined. Massage the marinade into the beef. Cover and refrigerate for 1-3 hours. Preheat the grill to medium-high. Grilling times will vary depending on the thickness of the meat, but plan on approximately 2-6 minutes per side. Grill until there’s just a hint of pink remaining in the center. Be sure the grill is hot enough to get a nice sear. Serving suggestion: Toss steamed rice or rice noodles with sliced raw vegetables and fresh herbs (such as basil, mint, cilantro, green onions, and dill), and dress with a dressing made up of equal parts lime juice, sugar, fish sauce, and warm water. Place the beef on top. With each bite, know that your sparkle is luminous!